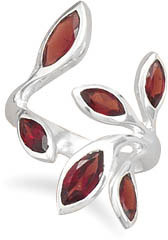 Wrap Around Garnet leaf ring. Marquise garnets vary in size. Ring measures 28mm (1 1/8") at the widest point and 3mm (1/8") at the narrowest. We guarantee our Wrap Around Floral Garnet Ring in Sterling Silver to be high quality, authentic jewelry, as described above.